I stayed here and did not travel much this summer because I believe this is the best place to be in summer. nd it both relaxing and powerful. 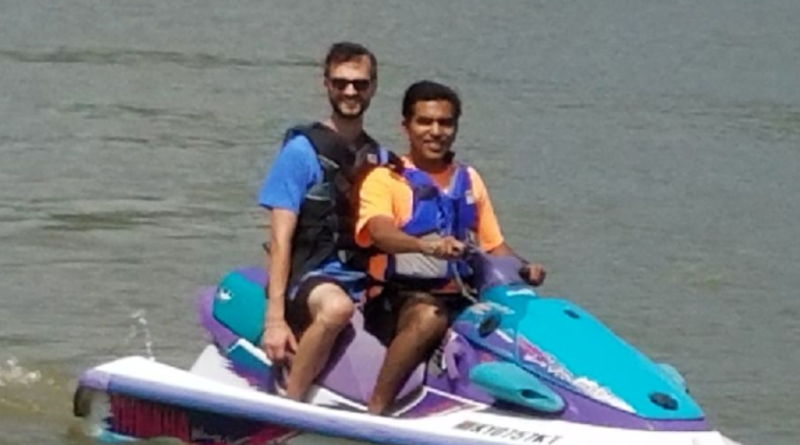 I also had a great chance to go for water skiing, knee-boarding and jet skiing. It was a challenging and new experience for me but I enjoyed it very much. Water-skiing gave me some spiritual thoughts. That is what I would like to share it with you. If you have ever been water-skiing or knee-boarding, you engaged in partnership with the power of the boat. You carefully positioned yourself behind the boat in the water, strategically held the rope, readied your body, and then gave a thumbs-up to the driver of the boat. The boat pulls you out of the water and takes you on a ride on the lake or river. You could not ski on your own power no matter how much you desired or how hard you tried. Only the boat could raise you. Only the boat could guide you and empower you to ride on top of the water. Spiritual transformation, has many similarities to my water skiing situation. Transformation is a cosmos-divine-human partnership, that helps us become more and more like Jesus. We work out our salvation (Philippians 2:12) because He works in us. Just as we can’t pull ourselves out of the water, we can’t transform ourselves. Only He has the power to mold us, to make us more like Himself however we are commanded to put ourselves in a position for this transformation to occur. This is why spiritual disciplines must be present in our lives. The disciplines, in and of themselves, do not transform us but they do put us in a position to be transformed. The diligent practice of spiritual disciplines puts us in a posture of growing more in His grace through the power of the Spirit within us. The disciplines are a grace-driven effort at work. Without the Spirit, the disciplines are religious machinations, empty and powerless – much like attempting to ski without a boat. As we begin a new school year, I encourage all students to evaluate the spiritual disciplines that are present in your life. Practicing spiritual disciplines is, in some sense, like telling the driver of the boat we are ready to go…ready to grow… allowing the boat to pull you so that you can ski well! Are you ready to be pulled by Jesus? Then you can fly on water. If you are planning to fly, don’t forget to strengthen your muscles by doing a spiritual work out, when you are pulled by boat. Would you like join with me for ski? Let me know your fun activities on summer. I was hearing a lot of summer activities from kids. I am excited to hear from you!